Portable probe for automatic image analysis for Brinell tests (1-3000Kg), repeatability +/- 0.1 HBW with instrument management by a built-in tablet, selection of loads and automatic test scales from a menu, automatic measurement. The absolute measurement is already valid at the first test. It is possible to perform tests on untreated or uncleaned surfaces, ideal for use in foundries and forging workshops. The Brinell indentation is read by a built-in camera and monitor with very high definition electronic measurement, with precision 1 micron and enlargements from 20x to 400x. The entire measurement cycle is automatic, from auto-focus to light adjustment. The image of the indentation and of the surface of the test piece can be exported. It is also possible to export the test certificate, with statistical analysis, storage of the image and transmission of images over a network. Large memory for storing data and tests, with archive management. The instrument is built with the certification requirements of the calibration bodies. 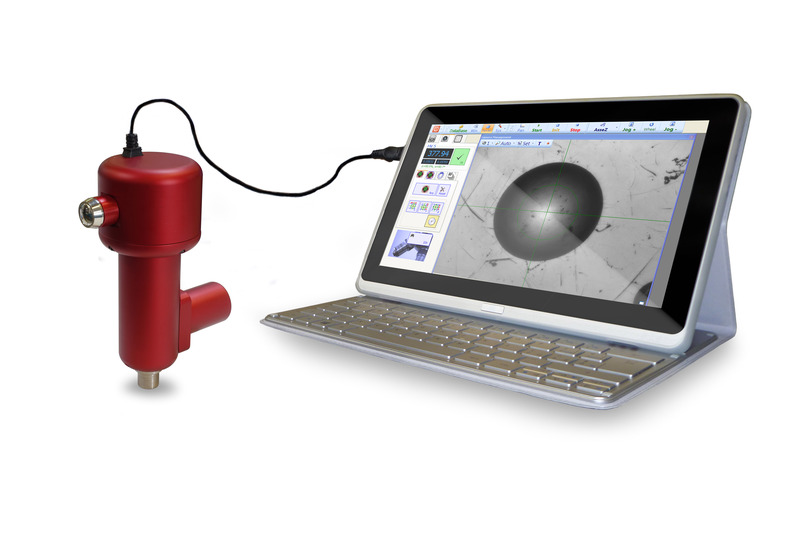 The probe is managed using a table with Windows 8 operating system, colour touch screen and a software program developed internally by EASYDUR, with a guiding menu that enables the operator to follow the various phases of the test which are performed in sequence automatically: choice of tests, rapid and precise Brinell measurements; storage of the images of the piece and of the indentations, dimensional measurements. The complete statistical program supplies diagrams and histograms and a vast data archive, as well as the printing of test certificates and the export of data with a network board. Easybrinell is a universal hardness gauge, programmed to take hardness measurements according to EN-ISO ASTM and DIN Standards on all type of metals and alloys, synthetic materials, ceramics, abrasive stones, plastic, rubber, inert materials and many more. The methods adopted are: Brinell, EN-ISO 6506 and ASTM E10 standards. In is possible to perform metallographic checks on metal structures and take measurements of the depth of the hardness surface treatment. It may be used in quality control laboratories, in production departments for rapid measurements, batch selections, in research institutes, technical colleges and universities.